Apparently not. Not any more. Not everyone wants to change the world. To the Beatles in 1968, when young people aged less than 30 added up to 52% of the US population, it might have looked like everyone wanted a revolution and that a nascent movement had a deep reserve of younger cohorts ready to push for change. But the percentage of the population aged less than 30 today is only 39% and falling. If 39% vs. 52% does not look like a big difference, consider that 13% of the US population is equivalent to 42 million additional young people who would be among us, if the percentage was the same as in 1968. A quarter to a third (10 to 14 million) would be in their 20s. At the same time, because older more conservative generations would weigh less in the total population mix, their moderating influence would be less effective at deterring the young. This shift in the age distribution of the population explains why the youth revolt gained traction in 1968 but more recent attempts such as Occupy Wall Street turned to farce and fizzled out. Meanwhile the over-45 age bracket now accounts for 41% of the US population (vs. 31% in 1968), its highest level ever and a level that explains the elevation of the two oldest presidential nominees in US history, Hillary Clinton and Donald Trump. It also helps explain why the nostalgia-powered Trump is still a contender while the youth-oriented Bernie Sanders has withdrawn. At this stage of the process in 1970, Sanders would have been the nominee while Clinton and Trump would have already left the scene. Revolutions don’t require majorities, but rather angry and excited minorities that are willing to act violently to take power. Undoubtedly true, but they also require a critical mass of young people combined with fairly dismal economic conditions which Turkey does not have now to the same extent as Iran in 1979. In 1979 in Iran, the under 30 accounted for a huge 71% of the population and Iranian GDP per capita on a PPP basis was about $2,000 (in 2013 dollars). By contrast, in Turkey today, the under 30 are only 50% and GDP per capita is in excess of $10,000. That is enough young people to shake things up as the young did in the West in 1968 but probably not enough to impose a lasting change as the young did in Iran in 1979. A general hypothesis therefore is that the danger of civil unrest grows when per capita GDP is low and the population is young. Looking at successful uprisings in Algeria (1962), China (1949), Cuba (1952) and Iran (1979), we note that the under 30 numbered more than 60% in every case. Meanwhile revolts failed in Hungary (1956) and Czechoslovakia (1968) where the under 30 were less than 50% of total population. Of course, this is not a comprehensive list and there may be examples that refute the hypothesis. In addition, foreign interference as in Hungary and Czechoslovakia renders the age distribution less relevant to the outcome of a revolt. But it is a fair bet that a larger young population in a lower-income country heightens the risk of unrest. The graph below shows for each country the per capita GDP in 2014 dollars and the percentage of people aged less than 30. The US is shown in red. The cutoff levels are set at $5000 for GDP per capita and at 60% for population aged under 30. Countries in the upper left quadrant are wealthier and have fewer young people and are as a result at lower risk of civil unrest. 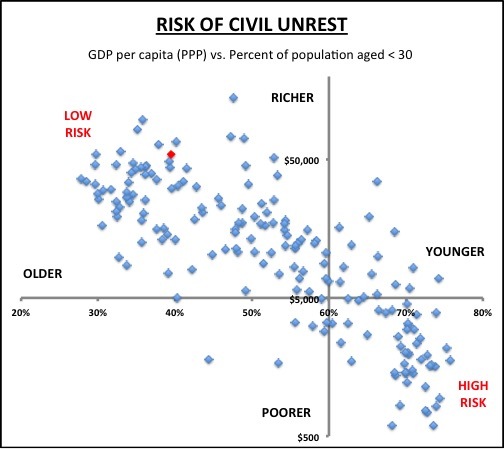 Countries in the lower right are younger and poorer and have in theory a higher risk of civil unrest. Iran in 1979 was clearly in the lower right high-risk quadrant. Turkey today is in the upper left lower-risk quadrant. Readers of this site may be familiar with this graph from a previous post discussing the relationship of fertility and national income. It is worth revisiting the earlier post to understand why some countries are outliers on the graph. So what are the countries that fall in the lower right quadrant? These countries have an under 30 population of 60% or more of total, and a GDP per capita of $5,000 or less. Here is the list. 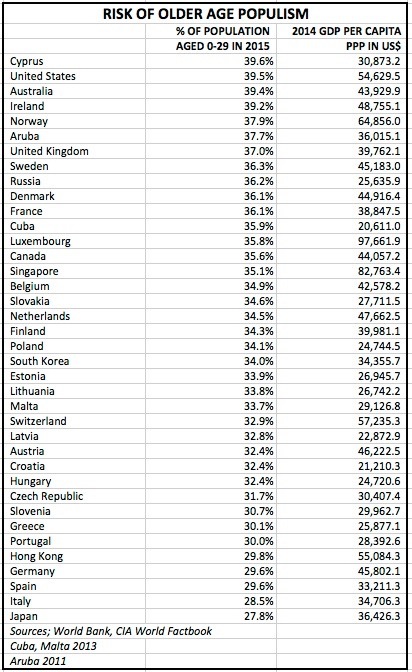 At the other extreme, if we look at Brexit and the nomination of Donald Trump as examples of a new form of revolt that we may call ‘older age populism’, here are the countries that are exposed to it, using as cutoffs $20,000 for GDP per capita and 40% for population aged less than 30. Not surprisingly, most of these countries are part of the West and most enjoyed a significant demographic dividend in the three decades 1975-2005. Read more about why Occupy Wall Street failed.